Well yesterday I went to my second Comic Con (MCM Birmingham Comic Con), this time with my best friend Kylie, I had encouraged her to dress up so I thought I really should too, I chose to go as Tony Stark, Iron Man, why? Well probably because I’ve always liked that character and his new reincarnation played by Robert Downey Jr. is just awesome. It actually turned out to be a great choice, in some ways I can relate to Iron Man, he needs a machine to stay alive too, he loves science, he’s great with technology, he uses humour to deflect, he broods, I may not be quite as good with the ladies but you can’t have it all I guess. 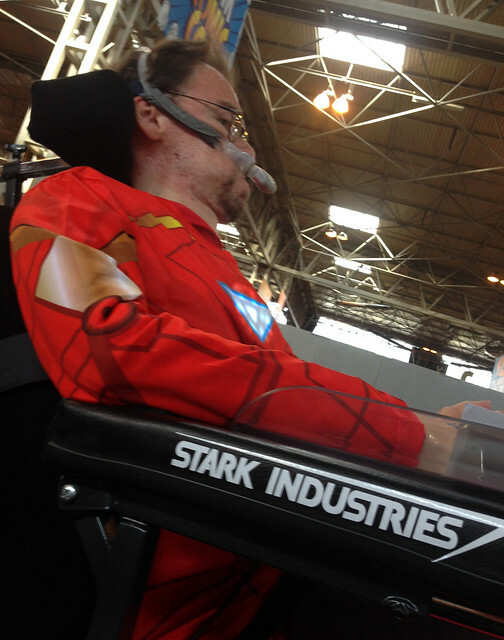 Anyway first I saw an Iron Man T-Shirt on ebay, it was cool so I ordered it, but I realised that really wasn’t enough, I bought some Stark Industries stickers for my wheelchair (which fitted with my backstory, Iron Man has a big right and only just survives, he builds an awesome wheelchair and uses a ventilator while recovering). Next I thought I really should have an arc reactor, I figured someone must sell an LED one, there were some on ebay but they were all sound activated, then I found that Marvel had made a T-Shirt with just what I wanted, unfortunately it wasn’t for sale outside of the U.S. but there was one person on ebay who had a couple, I got that, took the LED arc reactor out and put it in my Iron Man T-shirt. Of course then I realised I couldn’t wear black trousers and socks, I went to Next (I’d had a voucher as a Christmas present) and bought some yellow socks, finding red trousers wasn’t so easy, luckily sport relief were selling red onesies at Sainsbury, so I got one to wear underneath. Of course to be Tony Stark you have to have the beard, luckily my hair grows rather quickly so I managed to get a decent enough facsimile in about three weeks, I also resorted to hair Gel and hair straighteners to finish the look. It turned out okay I think, I got lots of smiles and comments, Sandman asked for a photo with me, Sophie Aldred said it looked great and a kid walking passed actually said “Hello Iron Man”, I’m pleased with my first attempt at cosplay, I need to make it a little better for next time but it won’t be easy as I can’t wear a proper costume, maybe I’ll start with red metallic shin pads…. Kylie dressed up as Poison Ivy and looked brilliant, she was very brave going all out, lots of people commented on her costume, it was great seeing her enjoying herself, she did have some anxiety build up with the mass of people and noise but we went to a quiet hall for her to have a drink and some food, I’m really proud of her especially as this was her first comic con. I coped okay with the crowds surprisingly, no anxiety at all, the only anxiety I had stemmed from my ventilator battery not charging properly the night before, luckily it lasted until I got home. The day itself began with rushing through the crowds to get to the Sleepy Hollow photoshoot, this was the main thing I wanted, the tickets were £20 each so I only went for one person, I would have loved all three ladies but I just couldn’t justify £60, so I had my picture taken with Nicole Beharie. She was gorgeous and very nice in the short time it took to take the photo, she even asked to get closer which I definitely didn’t mind! After Nicole we sought out Sophie Aldred who I’d had a childhood crush on when she played Ace in Dr Who, I managed to get her autograph but it was so noisy she couldn’t really hear me, after this we went to relax in the panel section and I got to see Greyston Holt who was talking about his new werewolf series Bitten. Then we just looked around for a while at stalls and cosplayers, hopefully my eyes weren’t bulging out of my head too much, there were lots of very pretty women and lots of clevage. We returned to the panel tent to watch the Sleepy Hollow girls give their panel, it was a really enjoyable panel and they were all charming, again noise was an issue and they had trouble hearing questions from the audience and we couldn’t always hear them either, I really hope MCM do something about this in future events. The day was an enjoyable one and I wish I could of gone back today despite the fact my backside still aches from being in the chair all day, I couldn’t really have afforded a second day anyway, my next Comic Con will probably be in the summer and then hopefully back to Birmingham for MCM’s November con with Kylie. Kylie’s post about ComicCon can be found here. 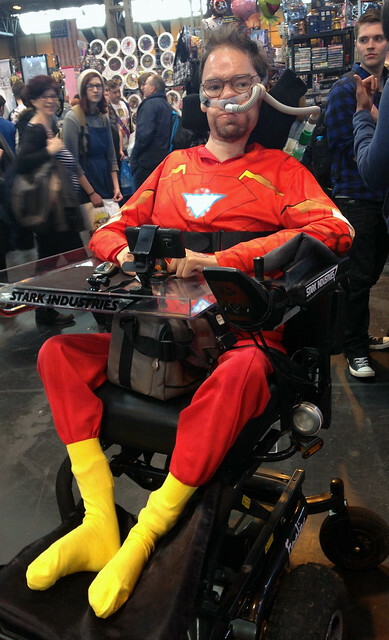 This entry was posted in Geeky and tagged comic con, cosplay, Daniel Baker, Duchenne Muscular Dystrophy, iron man, Nicole Beharie, sleepy hollow, Sophie Aldred, tony stark, wheelchair. Bookmark the permalink. 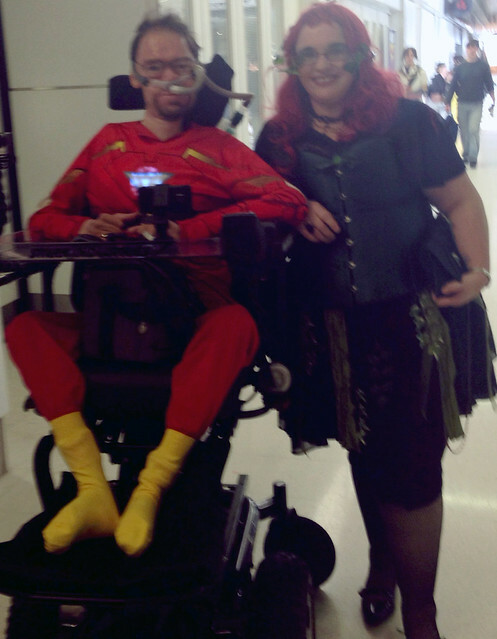 Thank you so much for encouraging me to go to comic con, but most of all to push my boundaries and dress as poison ivy. I really did enjoy it. It was great to see people staring at you with admiration. A lot of the men were staring too with envy at your cool prop I think it took a few a minute or two to click that you had a disability and it wasn’t just a prop! You looked so handsome, I hope you pick up Iron Man’s knack with the ladies!